The ModMic 4 offers an ingenious way to attach a precision­designed boom microphone to virtually any pair of headphones, to give you a complete communications solution. All ModMics feature a patented design that marries the performance of the microphone with features that optimize comfort and utility. The ModMic 4.0 Uni­directional microphone is a great choice for noisy environments thanks to the superior noise­canceling performance of the cardioid capsule. It's a popular choice for gaming and office VOIP use. Available with or without mute switch. 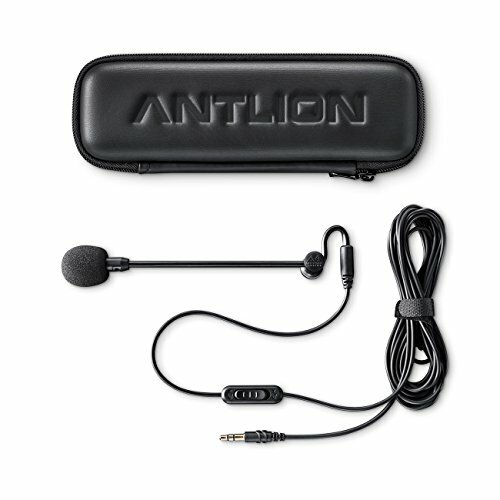 ADD A MIC TO YOUR HEADPHONES - The Antlion Audio ModMic 4 is an attachable microphone which allows you to turn your favorite headphones into a headset. You can attach a microphone to your headphones with a magnet, making it easy to remove or attach when you don't need a microphone. ELIMINATES BACKGROUND NOISE - The ModMic 4 features a noise-reducing uni-directional microphone, which only lets in sound from one direction, radically reducing or eliminating noise that comes from other sources in the room. QUICK AND EASY SETUP - Your ModMic can be used with practically any device. It features a standard 3.5mm jack for immediate plug & play on a PC. Add an Antlion Y adapter and you can use your ModMic and headphone combo for gaming on Xbox One, PS4, Wii-U, and even your smartphone. Add our USB adapter for enhanced quality or Mac systems. WORK OR PLAY WITH THE MODMIC - The ModMic's ability to attach to your favorite headphones and provide clear and effective communication makes it perfect for multi-player gaming or VOIP calls in quiet or noisy environments. COMFORTABLE - The ModMic is also an adjustable boom microphone, allowing you the flexibility to bend and adjust the capsule to your desired comfortable and effective position. If you have any questions about this product by Antlion Audio, contact us by completing and submitting the form below. If you are looking for a specif part number, please include it with your message.